IJDMTA provides online manuscript tracking system. Every issue of Journal of IJDMTA is available online from volume 1 issue 1 to the latest published issue with month and year. International Journal of Data Mining Techniques and Applications is a peer-reviewed bi-annual journal that publishes high-quality papers on all aspects of Data Mining Techniques and Applications. 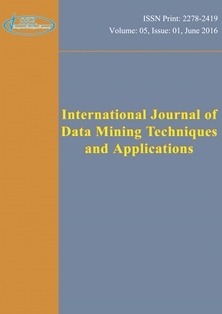 The primary objective of International Journal of Data Mining Techniques and Applications is to be an authoritative portal for sharing theoretical and innovative research findings in data mining concepts and its implementations. All manuscripts are subjected to peer review process and those of high quality (which are not previously published and are not under consideration for publication by another journal) would be published without any delay in subsequent issue. Online submission of the manuscript is strongly recommended. A manuscript number will be mailed to the corresponding author within five working days . Submission of a manuscript indicates a tacit understanding that the paper is not under consideration for publication with other journals. If copyrighted material is used, the author should obtain the necessary copyright release and submit it along with the manuscript. All papers will be acknowledged and refereed. The review process is double-blind; that is, the reviewer does not know who the manuscript author(s) is and the author(s) does not know who has reviewed the manuscript. The editor is responsible for deciding which of the papers submitted to the journal will be published. The editor will evaluate manuscripts without regard to the authors' race, gender, sexual orientation, religious belief, ethnic origin, citizenship, or political philosophy. The decision will be based on the papers importance, originality and clarity, and the studys validity and its relevance to the journal's scope. Current legal requirements regarding libel, copyright infringement, and plagiarism should also be considered. Confidentiality The editor and any editorial staff must not disclose any information about a submitted manuscript to anyone other than the corresponding author, reviewers, potential reviewers, other editorial advisers, and the publisher, as appropriate. Disclosure and conflicts of interest Unpublished materials disclosed in a submitted paper will not be used by the editor or the members of the editorial board for their own research purposes without the author's explicit written consent. Authorship of the Paper Authorship should be limited to those who have made a significant contribution to the conception, design, execution, or interpretation of the reported study. All those who have made significant contributions should be listed as co-authors. Disclosure and Conflicts of Interest All authors should include a statement disclosing any financial or other substantive conflicts of interest that may be construed to influence the results or interpretation of their manuscript. All sources of financial support for the project should be disclosed. Fundamental Errors in Published Works When an author discovers a significant error or inaccuracy in his/her own published work, it is the author’s obligation to promptly notify the journal editor or publisher and to cooperate with the editor to retract or correct the paper in form of an erratum. The articles should clearly describe new and carefully confirmed results and experimental procedure which should be given in required details for others to verify the work.For proper referring and fast publication all manuscript should be grammatically correct. Manuscripts will be subjected to peer review process to determine their suitability for publication provided they fulfill the requirements of the journal as laid out in the instructions to authors. After the review, manuscripts will be returned for revision along with reviewer's and/or editor's comments. Prepare the manuscript in Times New Roman font using a font size of 10. There shall not be any decorative borders anywhere in the text including the title page. The manuscript should be prepared in English using "MS Word" with the specified double column format. "Times New Roman" font should be used.All research article should be typed single spaced and should have the following sections: Title page, Abstract, Key words, Introduction, Materials and methods, Results, Discussion, Conclusion, Acknowledgement (if any) and References. The research article should contain minimum 5 pages to maximum of 8 pages. All pages are strictly formatted according to the double column format. Author can download the format in word document. The title should appear on a First page which should then followed by the author name and the institution name and address by indicating suitable superscripts. Title page should contain title of the paper in bold face, title case (font size 24), names of the authors in normal face, upper case(font size 11) followed by the address. This section should follow by the title and should detail the problems, experimental approach, major findings and conclusion in one paragraph and should appear on the second page. Avoid abbreviation, diagram and references in the abstract. It should be single - spaced and should not exceed 250 words for full papers. Author(s) must give about 4-6 key words which can identify the most important subjects covered by the paper. They must be placed at the end of the abstract. This section must contain specific details about the materials studied, instruments used, specialized sources and related experimental details which allows other research worker to reproduce the results. Obtain permission for all fully borrowed, adapted, and modified tables and provide a credit line in the footnote. The results should be concisely presented. Results and discussion may be separate or combined based on the author's requirement. Tables and figures should be designed to maximize the comprehension of the experimental data. The interpreted results should be explained clearly in discussions and should relate them to the existing knowledge in the field as clearly as possible.Tables, Graphs and figures (Illustrations) should be inserted in to the main text at respective place they should appear when published and should have appropriate numbers and titles with an explanatory heading. The table, graph and figures heading may have smaller font titles but should not be less than 10 pt in size. Labels of the table, graph and figures MUST be in the text form and should not form part of the image.Color photographs and illustrations (line drawings, halftones, photos, photomicrographs etc) must be clean originals or digital files would be charged that may be intimated along with the acceptance letter. Those photographs must be clear and sharp. Digital files are recommended for highest quality reproduction and should follow the following guidelines. Organization of the review article is at the authors' discretion and must be at a length of 3000 words excluding references and abstract. Abstract and key words are required. Tables, figures, illustrations and references are to be arranged according to research papers. Submission of the manuscript represent that the manuscript has not been published previously and is not considered for publication elsewhere. Authors would be required to sign a CTA form (Copy Right Transfer Agreement) once the manuscript is accepted which would be sent to the corresponding author's email. The corresponding author can download the form and after getting authors and co-authors signature it can be send as an attachment file after scanning to the journal or by post/courier along with the publication charges. Galley proofs would be sent unless indicated otherwise to the corresponding author. It is the responsibility of the corresponding author to ensure that the galley proofs are to be returned without delay with correction if (any). The authors are responsible for the contents appeared in their published manuscripts.